Belmont County and St. Clairsville played a unique role in the production and showing of a major American documentary film about rural electrification, Power and the Land. In 1939, Pare Lorentz of the United States Film Service and Dutch filmmaker Joris Ivens agreed that the Bill and Hazel Parkinson farm of Warnock, Ohio (just south of St. Clairsville) would be featured in a film being produced for the Rural Electrification Administration. This promotional government film was to show life on the farm before and after electricity. The film featured Bill and Hazel and their children: Dan, Tom, Jake, Ruth, and Frank ("Bip".) The resulting film had its premiere on August 31, 1940 in the Old Trail Theater in nearby St. Clairsville. The Parkinsons, filmmaker Joris Ivens and REA officials were in attendance. This REA film subsequently was shown to an estimated four million American farmers. That classic 1940 film Power and the Land is now the subject of a new documentary (released in 2008). 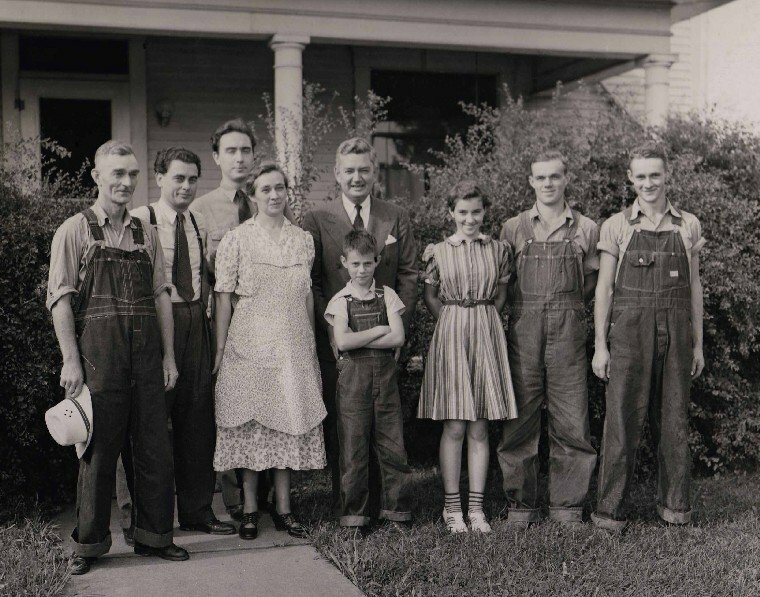 Produced by Dr. Ephraim K. Smith (Heritage Productions, Inc.) and narrated by Walter Cronkite, this new documentary, Power for the Parkinsons, describes how the Parkinson family and Power and the Land helped electrify the American farm. The premiere of Power and the Land in St. Clairsville on August 31, 1940 also gives that community a unique status. In Power for the Parkisons, Dr. Robert L, Snyder, a retired Professor of Film, Radio, and Television at the University of Wisconsin, Oshkosh, notes that the 1940 film was being distributed for the REA by RKO Pictures, a major Hollywood company. The town of St. Clairsville was thus, he argues, the smallest town in the United State ever to host a major motion picture preview. Heritage Productions Inc. has also released a sequel film to Power for the Parkisons. Also narrated by Walter Cronkite, this sequel film, entitled The Parkinsons, tells the story of what happened to that family after August, 1940. Two of the Parkinson boys fought in World War II, the only daughter becomes a nurse, and Bip, the youngest son, goes off to fight in Korea. Although none of the Parkinsons who appeared in the 1940 film are still alive today, Bill and Hazel's grandchildren and other relatives and friends appear in both of these new documentaries: Power for the Parkisons and The Parkinsons. Both documentaries are available for sale at www.powerforparkinsons.com. Acknowledgement: Portions of this entry are reprinted with permission of Dr. Ephraim K. Smith from the powerforparkinsons website.